Scaling a software company from founding to IPO is no easy feat, and if the business raises equity capital, it’s quite dilutive for founders and employees. 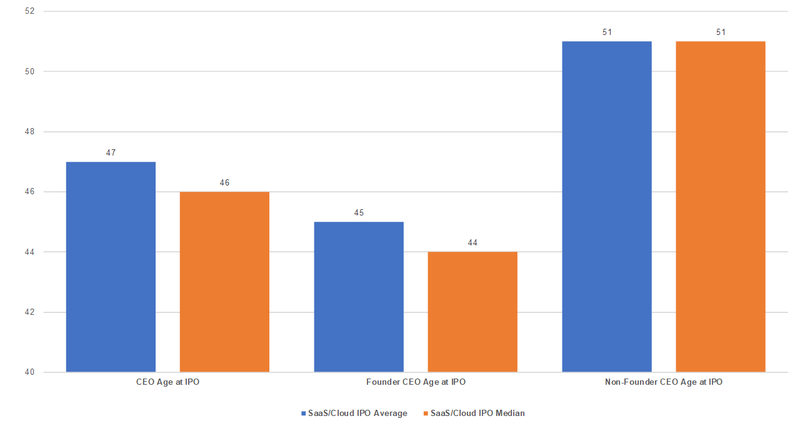 I benchmarked a group of ~60 SaaS/cloud/software IPOs and looked at a few things — if at IPO the founder or co-founder was still the CEO, equity ownership pre-and post-IPO, age of CEO, and compensation. Note that in many cases founders/CEOs sell part of their ownership stake prior to going public in secondary offerings during the fundraising lifecycle, or during the IPO, so the post-IPO equity stakes represented below are on average lower than if they had just been diluted down by more new equity. Many have sold into the IPO too among this group. Moreover, founders and employees experience additional dilution from option pool expansion. Alteryx, Adaptive Insights, AppDynamics, AppFolio, Appian, Apptio, Atlassian, Avalara, BlackLine, Box, Carbon Black, Cloudera, Cornerstone OnDemand, Coupa, Cvent, Demandware, DocuSign, Domo, Dropbox, Five9, Eloqua, ExactTarget, Fleetmatics, HubSpot, Instructure, LogMeIn, Marketo, MINDBODY, MongoDB, MuleSoft, NetSuite, New Relic, Okta, OPOWER, Paycom, Paylocity, Pivotal, Pluralsight, Q2, SuccessFactors, Rally, Responsys, RingCentral, Salesforce, SendGrid, ServiceNow, Shopify, Smartsheet, Splunk, Tableau, Talend, Tenable, Twilio, Veeva, Wix, Workday, Workiva, Yext, Zendesk, Zscaler, and Zuora. Now take a look at post-IPO equity ownership for the CEOs of this group. After the IPO, the median ownership for a CEO is 6%. The blue bars indicate founders that were still the CEO at IPO, and the red bars indicate CEOs that were *not* founders at IPO. Not surprisingly, on average founders that are still CEOs at IPO have almost 3.5x more equity (after the IPO) than CEOs that were not founders. The output below has each company’s CEO equity ownership stake post-IPO. Taking a closer look, below is an output of only founder CEOs (from blue bars above). The median ownership is ~12% after the IPO. Now below is an output that just shows non-founder CEO ownership (the red bars from first chart), and as expected, their respective post-IPO equity ownership is much lower than founder CEOs. The median here is ~5%. Given IPOs are another form of fundraising, CEOs take additional dilution during the IPO and in some cases, sell into the IPO. 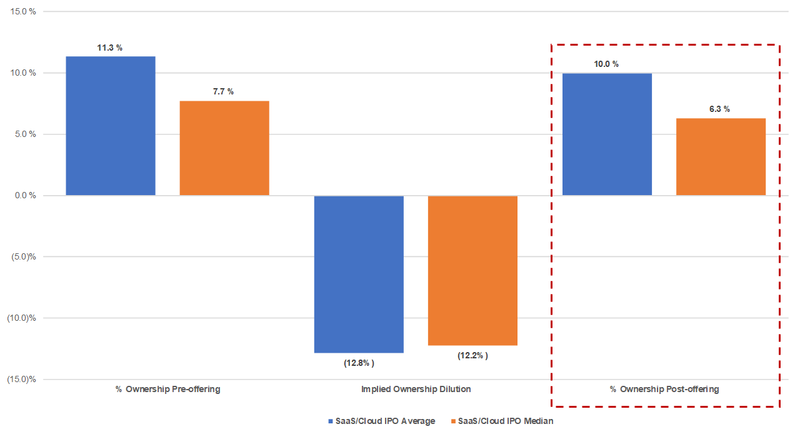 Below is an output of both pre and post-offering ownership medians and averages, as well as the implied IPO dilution. This includes all 61 companies. How old are CEOs when their companies IPO? The median age for a CEO is 46 years old at the IPO quarter. Founders CEOs are also younger than non-founder CEOs when their company goes public; founder CEOs were 44 and non-founder CEOs were 51, both on a median basis. 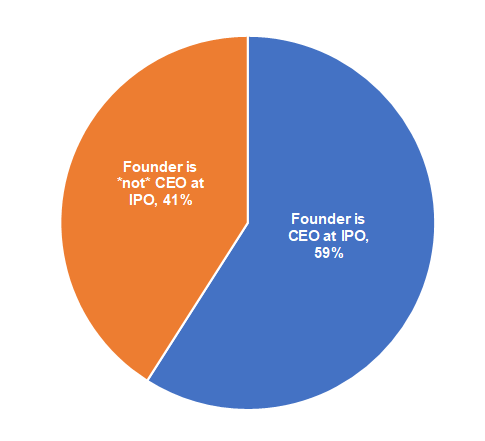 Additionally, for non-founder CEOs, they’re on average the CEO for 5 years before the IPO. With regard to compensation, the numbers vary significantly but below is an output with both annual salary, equity, non-equity and other comp, and total compensation in the IPO year. It’s worth calling out that 3 CEOs did not have a salary or it was at $1/year; Joshua Coates at Instructure, Marc Benioff at Salesforce, and Jay Choudary at Zscaler. Two out of the 61 companies had co-CEOs (Atlassian and Workday). Dan Springer also shows up twice on the list as the CEO of DocuSign and Responsys. The output below shows medians and averages. No two software companies follow the same path from founding → IPO, and there is significant variation within this group of 61 companies. It’s also a moving target as 10+ were added to the comparable set this year alone. With that said, this should shed some light on what a CEO could expect to own by the time his or her company goes public, which is ~12% for founder CEOs and ~5% for non-founder CEOs. 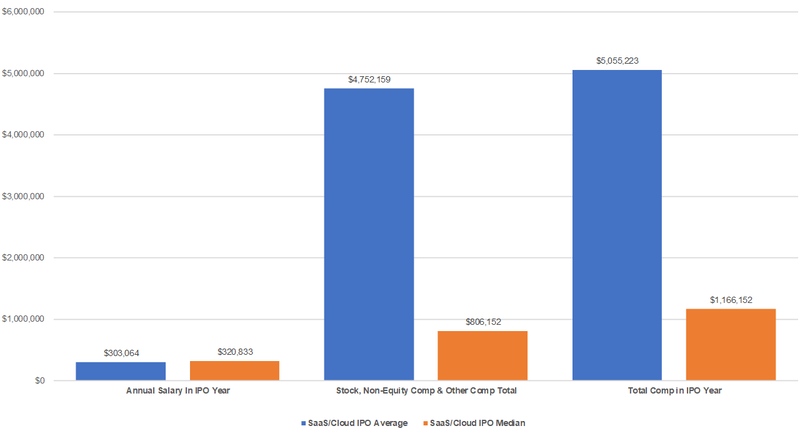 Raising equity capital is expensive and most companies need to sell a large portion of their businesses to reach IPO scale but can create significant value by doing so — Salesforce — the largest company in the comparable set, has a market cap of almost $115 billion at the time of this post. It had a market cap of $1.1B at IPO almost 15 years ago.